Proverbs is such a great book in the Bible for a parent to read no matter the age of your child, from baby to adult. Every time I read Proverbs I am helped with further wisdom and insight in how to live my life and how to improve as a parent. 1. ...who it is written to. Proverbs are written to the young men of Israel. Today I am living in a different administration as a born again child of God. In the New Testament we have even more wonderful truths about wisdom. 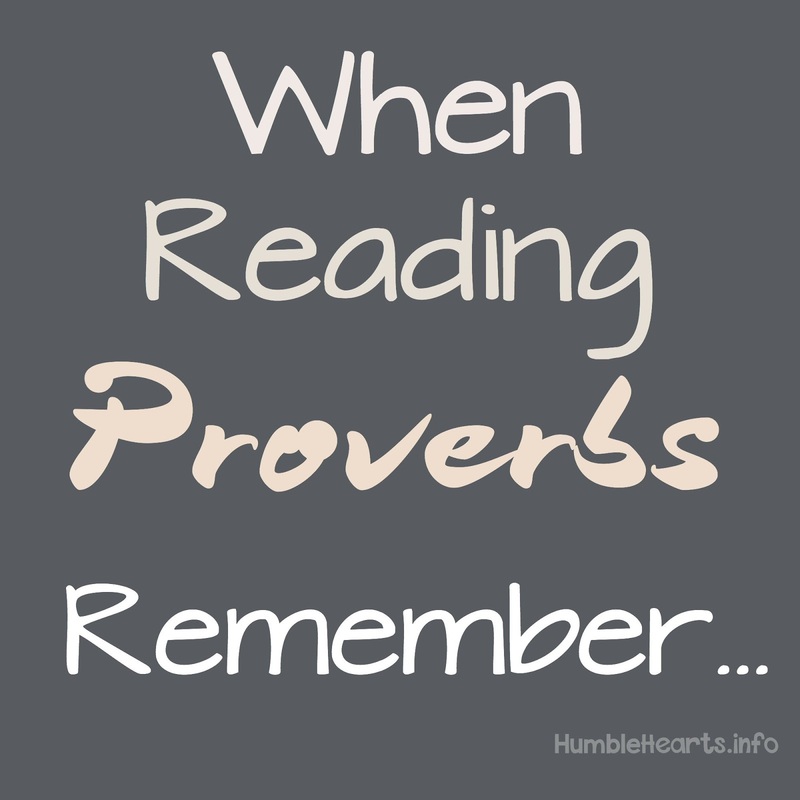 Keeping this in mind, I can still gain great knowledge, wisdom and insight from reading Proverbs. 2. ...the fear of the LORD. I need to come to Proverbs with an awe and reverence for God as I seek wisdom and knowledge. 3. ...wisdom is personified as a woman. In Proverbs wisdom is sometimes referred to as "she" or "her". In chapters 10 t0 31 many verses can stand alone and some relate to the context around them. Even the stand alone verses need to be taken in context of the book of Proverbs and in context of the whole Bible. There are many themes in Proverbs. A few of these themes are the wise vs. the fool, the righteous vs. the wicked, hard work vs. laziness. Also topics that relate to the wise use of words and topics that relate to parents and children. 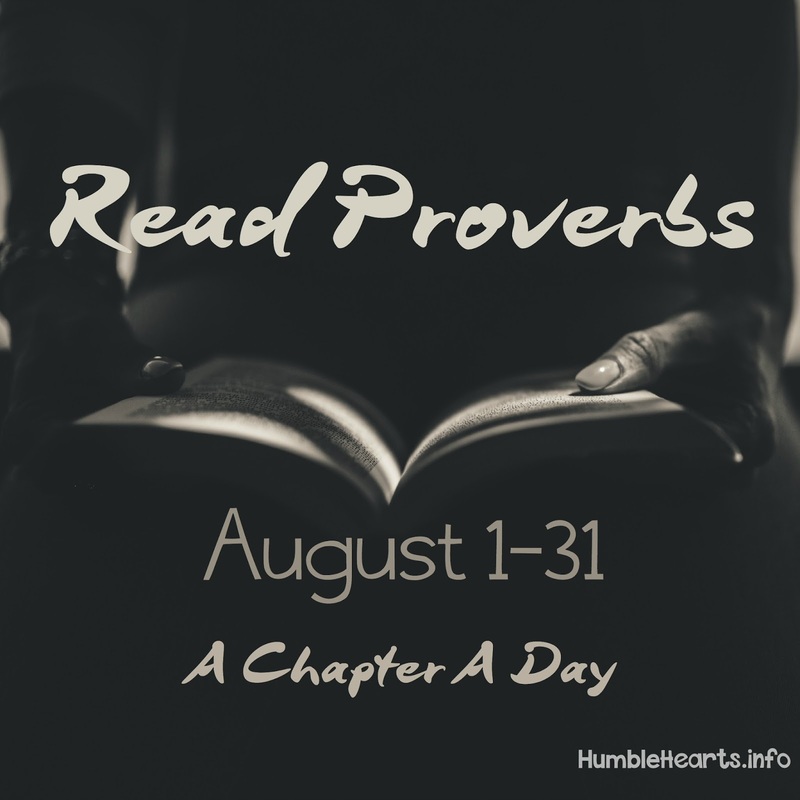 As you read through Proverbs you may want to jot down verses that relate to an area that you want to grow in. Or make note of areas you are teaching your child about. 6. ...pray and ask God for wisdom. While reading Proverbs, I want to be praying and asking God for wisdom, not just trying to figure this out on my own. 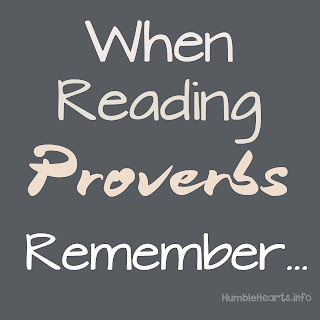 **Note: A great resource in helping to understand Proverbs is "Proverbs and The Wise Son" chapter 8 in "Scripture Consulting Select Studies" by Walter J. Cummins. 3. Read a verse a day. 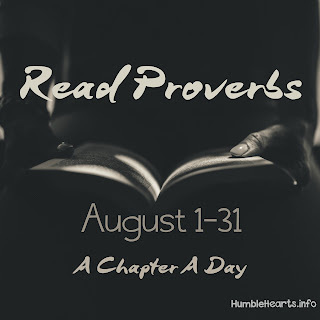 During the month of August follow Humble Hearts on Facebook, Instagram, or Pinterest where I'll be posting a verse a day from Proverbs for the whole month.